The Board of Appeal today approved a total of 27 new residential units across East Boston. Because none are in projects of 10 or more units, all can be sold at market or luxury rates, with no units designated for people making less than the median income. In a sign of political changes to come in the neighborhood, though, incoming City Councilor Lydia Edwards, who takes office in January, opposed two of the projects supported by outgoing Councilor Sal LaMattina. Read more. NorthEndWaterfront.com reports Councilor Sal LaMattina (North End, Charlestown, East Boston) won't run for re-election this fall. The East Boston Times-Free Press, which broke the story, has more. LaMattina, first elected in a special election in 2006, joins Bill Linehan (South Boston, South End, Downtown, Chinatown) and Tito Jackson (Roxbury) in the retirement club - although Jackson hopes to move to get elected mayor instead. The Boston City Council voted unanimously today to write a letter of "non-opposition" for a medical-marijuana dispensary proposed for 220 McClellan Highway in East Boston. Read more. Boston City Councilor Sal LaMattina says he sometimes gets frustrated with the otherwise beautiful view from Piers Park in East Boston: He can see the Seaport in South Boston, but knows the only way to get there by public transportation is via three subway lines and a bus. Read more. The City Council today gave BTD approval to expand a Charlestown pilot project in which street-sweeping fines would go from $40 to $90 - but the city wouldn't tow any cars. The council passed the measure only after including a provision that no neighborhoods get the changes regulation without a public hearing first. Read more. The City Council almost voted today on a zoning change that would prohibit both medical marijuana dispensaries and potential recreational pot shops from being closer than a mile to each other. Read more. The East Boston Times reports Councilor Sal LaMattina says East Boston is in desperate need of a second middle school. With additional reporting by Kayla Canne. City Councilor Sal LaMattina says he enjoys street performers. But faced with complaints about "bullying" from the amplifier-enhanced dancers in front of Faneuil Hall - from both tourists and other performers - he says it's time for Boston to consider some sort of busker regulations. Read more. City Councilors Sal LaMattina and Bill Linehan want to require street performers to buy $40 annual licenses for the right to perform on Boston streets. The city council tomorrow considers their request for a hearing on a proposed ordinance that would require street performers to wear their permits - and to show them to inquiring police officers and to stay at least 100 feet away from elementary schools and hospitals - and at least 50 feet away from other buskers. Read more. Matthew Walsh tells councilors treatment programs for people like him need more resources. Substance-abuse experts and recovering addicts say a proposal by City Councilors Bill Linehan and Frank Baker to fund new treatment programs through a 2% tax on Boston alcohol sales could provide new beds - and new hope - to addicts who now have to wait long periods for help. The City Council on Wednesday considers a request to begin looking at possible regulations over online services that let people rent apartments, such as Airbnb - and even Craigslist. Officials from the Boston Globe and the company it hired to distribute its advertising circulars told angry city councilors at a hearing today they're willing to try to keep Boston from being papered over with the circulars. A City Council committee next week attempts to bring Globe Direct to task for its unceasing efforts to plaster Boston's porches, sidewalks and shrubs with its advertising circulars. The hearing, by the council's Committee on City, Neighborhood Services and Veterans Affairs, starts at 4 p.m. on Thursday in the council's fifth-floor chambers in City Hall. City councilors from across the city said today their constituents are complaining about the seemingly unstoppable onslaught of plastic-sheathed Globe Direct ads. "These bags are everywhere," City Councilor Tim McCarthy (Hyde Park, Roslindale, Mattapan) said at a council meeting today. "Lawns, hedges, porches, steps." David Bernstein takes a look at a resolution before the City Council today to recognize the 60th anniversary of the Supreme Court's desegregation ruling. Ten councilors voted for it while councilors Bill Linehan, Steve Murphy and Sal LaMattina voted "present." LaMattina and Murphy talked to Bernstein about why he voted that way; Linehan and Yancey, who sponsored the measure, didn't return his calls. UPDATE: Linehan did talk to the Globe, said Yancey filed it at the last moment and he didn't really have a chance to read it and he wasn't going to vote on something he didn't have a chance to consider. 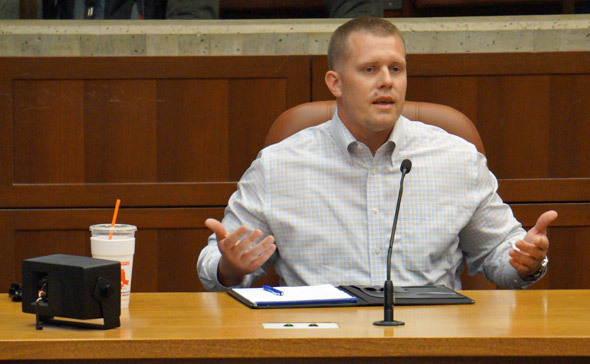 City Councilor Matt O'Malley (Jamaica Plain, West Roxbury) says clean business districts are better and even safer business districts and wants to look at increasing fines on "chronic" litterers. At a City Council meeting today, O'Malley said Boston's maximum littering fines are only $25, compared to $300 in New York and $1,500 in Chicago. O'Malley also wants to look at expanding the city "hokey" program, in which workers with trash bins on wheels go around business districts cleaning up and introducing new technolgy, such as the sort of "binless bins" the T uses for recycling newspapers. Councilor Matt O'Malley pets a dog named Ruth Bader Ginsburg. In JP, of course. A progressive leader who understands the importance of keeping families in the city by transforming our schools, creating more affordable housing options, and building safe and healthy neighborhoods throughout the city. Connolly has scheduled "an endorsement event" at his Roxbury campaign office at 5:15 p.m. today. Gosh, who could that be? Up until now, the candidates have mostly contented themselves with playing up their own platforms on issues. Casinos, however, change everything. I know that we recognize that protecting, preserving and improving our parks is vital to continuing to grow Boston's population and maintaining our status as a world class city.